OK, so this isn't a post dealing with a particularly earth-shaking issue! Still, it's something that continues to crop up and I get questions about it all the time, so I thought I'd address it. The issue? The horrible practice of wearing the deacon stole OVER the dalmatic! I'm old enough to remember very well the days prior to the Second Vatican Council. I began serving Mass in 1957 when I was seven years old, and often served two or three Masses a day. I then spent high school and college in the seminary during and after the Council; liturgically, that's a lot of experience! I first served as a liturgical Master of Ceremonies when I was 15. OK, that's some background. For centuries, the accepted practice for all clerics in the major orders was to wear the amice, alb, cincture, and maniple. Over these foundational vestments, the subdeacon added the outer vestement of the subdeacon, the tunicle. Over those same foundational vestments, the deacon added the stole (tied diagonally and held in place by the cincture) and then the outer vestment of the deacon, the dalmatic. Over those same foundational vestments, the priest added the stole (worn crossed over his chest and held in place by the cincture) and then the outer vestment of the priest, the chasuble. Notice the pattern? THE OUTER VESTMENT, by definition, was worn OVER EVERYTHING ELSE! Catholic clergy didn't adopt the Protestant practice of a "preaching stole" worn over other vestments. So -- what happened? Why do priests and now some deacons choose to wear these so-called "overlay" stoles? How did this liturgical novelty catch on, DESPITE liturgical guidance (read: law) otherwise? Let's get the legal stuff out of the way. The General Instruction of the Roman Missal (the GIRM) has always stated that the dalmatic or chasuble is worn OVER the stole and other foundational vestments. Period. So why do some choose to wear their liturgical "underwear" over their liturgical "outerwear"? I think there are a couple of things at play here. First -- and this is a good thing -- we have seen a wonderful emphasis on the primary role of the bishop, presbyter and deacon for preaching the Good News. I get that, and support it. This led some priests, immediately after the Council, to adopt the common practice of other Christian churches to wear the stole, associated by many of those Churches with the function of preaching, OVER their chasubles. Vestment makers picked up on this and began to design "overlay" stoles. Still, it's worth noting that the liturgical law of the Church has NOT changed on this regard: it still tells us to wear the stole UNDER the chasuble/dalmatic. What's next, wearing the cincture over the chasuble/dalmatic? How about throwing on an amice over everything? That would be an interesting look, too! Second -- for deacons, many of us are still getting used to the dalmatic. After the Council, most parishes got rid of their old "Mass sets": fiddleback chasubles, dalmatics/stoles, and tunicles. 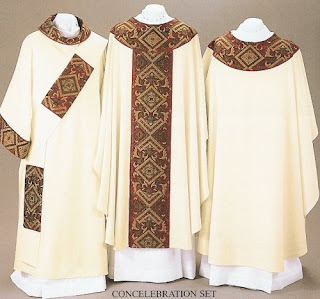 New liturgical vestment styles were developed, except that in the late 1960s and early 1970s these often didn't include vestments for the deacon, since the permanent diaconate was still in its infancy. This led to expedient of wearing an alb along with a "priest" stole tied or pinned diagonally. There were very few dalmatics. This led to the liturgical innovation of a deacon of the Mass wearing only an alb and a stole: this was NEVER the practice prior to the Council. So, deacons often associated the stole as the primary sign of their Order of Deacon. HOWEVER, the actual sign of the deacon is the DALMATIC: that is the vestment unique to the diaconate (and the episcopate). So, when overlay stoles were developed by the vestment makers, they gradually extended that mistake to the deacon's vestments as well, and some deacons have embraced it because they can wear "their" identifying vestment (mistakenly assumed to be the stole) in plain view over the dalmatic. During this time of ongoing liturgical renewal, it seems a good time to get back to the basics: Wear the stole UNDER the dalmatic! Very nice. Thanks and let's hope this proper use of the dalmatic catches on. Another liturgical error I have noticed is the deacon kneeling immediately after the Sanctus and then standing after the Mysterium Fidei. Aren't we supposed to kneel only from the Epiclesis through the elevation of the chalice out of respectful emphasis towards the Holy Spirit's transubstantion of the eucharistic elements? what's a dalmatic look like? If you look at the picture I posted with this entry, look at the vestment on the left. The garment shown UNDER the diagonal deacon stole (ugh) is the dalmatic. It is a sleeved garment, in the same liturgical color as the priest's chasuble. Yes, kneeling immediately after the Sanctus is too soon, you are correct. On the other hand, it is not absolute that we kneel at all, of course. The GIRM says "as a rule," which conveys the sense that there are exceptions to that rule. Many of our bishops don't want us to kneel since we can't get down, and then back up, easily enough. What's even more important is that such difficulties go far beyond an inconvenience for the aging knees of many deacons: it can be very distracting from the liturgical action. Part of the reason for deacons to kneel at that part of the Mass is to assist in focusing on the liturgical action going on, and if we're falling all over the place, we distract from that. In that case, it's better to stay standing. I was ordained a few years before you but bow to your wisdom on most things diaconal. This idea of constantly wearing a Dalmatic is -- in my mind -- more rubrical than sensible. --Dalmatics on "High Holy Days" -- such as Christmas (midnight and day); Easter (both Vigil and Day) and Pentecost. --Dalmatics on any ceremony with your local ordinary -- whether at the cathedral or not -- whether "high-holyday" or not. --Stole overlay on a better quality alb on the everyday Sunday "Deacon of the Gospel" assignment. --I usually do not use a Dalmatic at a funeral unless I am presiding at a ceremony outside of Mass but in a church. --I have never used a Dalmatic at a wedding nor a baptism nor a free-standing Communion Service. Part of it was that my generation (I was ordained in 1978) was never issued any instructions about the importance of a Dalmatic; part of it was that the parishes I worked at could rarely afford deacons' stoles much less Dalmatics; part of it was that we did not have experts like you hounding us to get authentic. Is this changing -- I think so but it will take time for those classes ordiained after 2000 -- the ones who have a more "gut-level" understanding of this issue -- to make their impact. Bill, I have not seen this particular over\under or under\over practice here in Atlanta. While in another diocese I did observe a deacon serving as MC (in cassock and surplus) put on his stole during the distribution of communion and then take it off after the vessels were purified. I was curious about the practice but didn't see anything about it in the GIRM or Ceremonial of Bishops. Did I miss it in one of those, was he "freelancing" from a vestment perspective or what. I did see in the CoB that generally even while serving as MC the deacon should vest in his dalmatic. The practice in our archdiocese is cassock and surplus but never adding the stole. "Kids these days! Backward hats and walking oddly." More examples of distraction from pursuit of faith and spiritual growth, by the convenient but distracting issues of the architecture of religion. I don't dismiss the comfort or healing value of ritual at all levels of spiritual endeavor, nor the importance of social development of every religion. Although a tightrope is a weak analogy for the journey of spiritual and earthly life, personal balance is an important attractor. As far as I am concerned, the deacon and the presider are as one at the altar, each with his own role. The ministry of sacrifice together with the ministry of service while at the altar offers a more complete picture of Jesus Who offers Himself in charity. In that regard, matching vestments presents a unified picture that a his and his parts. As a would be Deacon (about to start the second year of "formal" formation in the UK) I would welcome a comprehensive guide to liturgical dress. Not just for Deacons but for Priests and bishops as well. Any recommendations? As an acolyte in Northern Virginia 50 years ago, we received a special vestments missal, ‘Habits Primer’, which covered everything mass participants, from parishioner to Pope, were expected to wear all year. It was an thick old book, as big as an ordinary, large print missal, which all the boys in my cohort had to share. It was bright blue leather yapp binding and gilt encirclinga, but I am not confident of my memory of the title or other details. Obviously, vestments have changed over the years, but if you can find a copy, it might be a touch stone and possibly rationales for some deacon paraphernalia. It would help if I included the url!!! In the "old" days, it was not uncommon to see a priest-MC (in cassock and surplice) put on a stole to help distribute communion. This practice was (supposedly) eliminated following the Council. People are supposed to exercise one function at Mass and then do it "solely but completely." The liturgical MC, despite the impression given in many places, is properly a LAY ministry. I first served as an MC at age 15 as a high school seminarian home for Holy Week. Now, while many bishops persist in having clerics serve as MCs, many are now training lay persons to exercise that role. Furthermore, the role of the MC grew in popularity when the liturgical role of the deacon was in decline. 2) IF a presbyter/deacon serves as MC, he should do so WITHOUT the liturgical vestments of his order, since he's not there exercising that order. The CoB, I hope, will be corrected in future editions; after all, we don't ask priest-MCs to wear stole and chasuble when THEY MC! 3) And, finally, a cleric-MC should NOT put on a stole to help distribute communion. If the ceremony is important enough to need an MC in the first place, then there must be sufficient ministers of communion lurking someplace! Reminds me of Sue Ellen Mischke, heiress to the Oh Henry candy bar fortune, on Seinfeld. My family moved when I was growing up, so I attended three Catholic grade schools, two Catholic high schools, and a Catholic college. I have belonged to, and been an active member, of nine parishes. I have never, as far as I know, been to a mass with an MC. What is the MC's role? In formation (and my practice today), I was taught that the Dalmatic is a Eucharistic vestment and is to be worn by the deacon only during Mass; never to be worn when a deacon officiates at a wedding, a funeral vigil or a baptism outside of Mass. I was once told the bishop wears a dalmatic under a chasible when installing deacons. Is the true? Moving On. . . . What shall we talk about?